New a³ for MPC603e with universal DDR controller support. New a³ for PPC750 with universal DDR controller support. New a³ for x86 with StackAnalyzer for x86 and x86rm. QSKs are now available from the a³ GUI via “Help” → “Qualify…” (see screenshot). verifying that irreducible loops cannot be handled by loop annotations but by flow constraints. The QSK for StackAnalyzer for PowerPC with gcc-4.1.2 now includes hardware stack measurement tests. 32-bit and 64-bit Linux only: Programs now report a backtrace if they abort. Please include this backtrace when contacting support. Improved performance for projects with many analyses. Clicking on a link in an error message now opens a menu where you can select whether you want to go to the corresponding place in the source or disassembly view (see screenshot). The colors used for highlighting in the AIS editor can now be customized. General improvements to the toolbar and the view handling. The shortcut for stopping analyses is now F4. The previously used Ctrl + Esc is no longer supported. Improved Configuration view (see screenshot). Improved address value input fields (see screenshot). The editor always displays and keeps up-to-date the information about which parts of the code are infeasible or contribute to the WCET or maximum stack usage. The debug views correctly display the addresses of variables that are relative to the contents of a register. Better handling of the unbounded/infeasible result for computations. 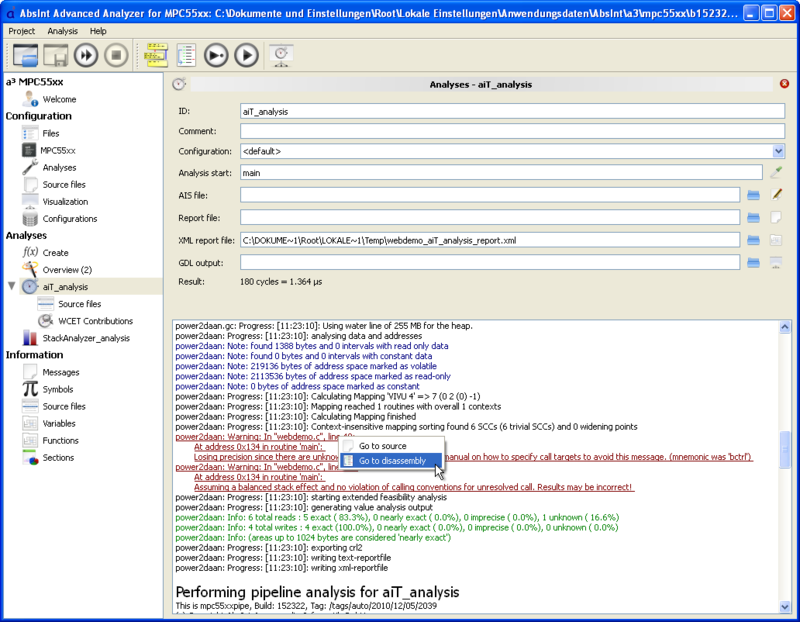 Existing XML result files are now loaded upon opening a project, to display results of already performed analyses. The user may now override the default unroll parameter at loop level. Improved annotation export for the “Export project” option. mem <unit> (<addr>) is now written as mem (<addr>, <unit>). mem <byte_order> (<addr>) is now written as mem (<addr>, <byte_order>). New annotation “always returns” enables specifying that an external routine always returns and therefore is not a possible end of the program. 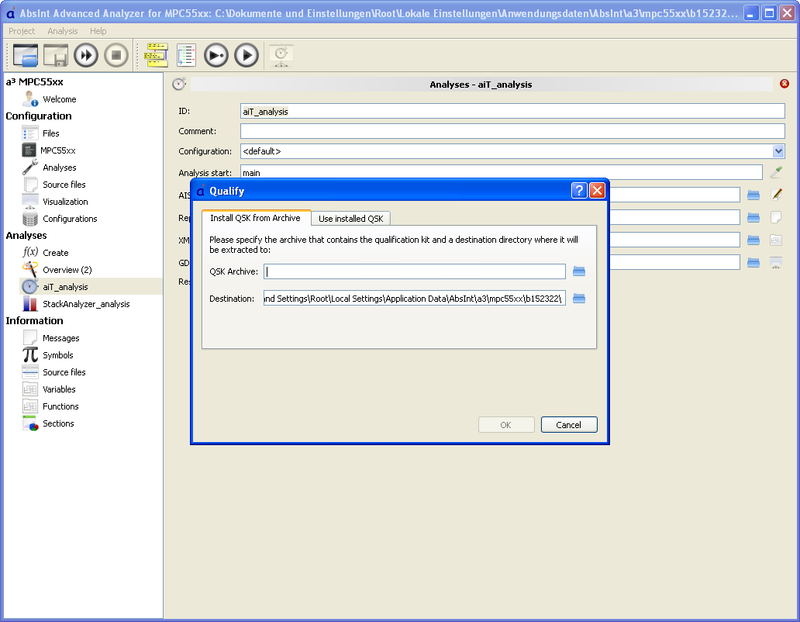 The new “:analysis_start” label enables referring to the analysis entry symbolically in AIS files. Program headers are ignored by default for section creation. Only if no valid sections are found for each program header a section is created. You can switch back to the old behavior by checking “Always Read Program Headers” in the advanced options. Improved pattern matching for switch table detection. Better handling of ambigious names for one address, e.g. global symbol names are now preferred. exec2crl now lists all recursive routines. GHS compiler: short function names are now preferred for graph visualisation, e.g. “test” instead of “test@C:/test.c”. Long names are still used in annotations and elsewhere, when using a short name would introduce ambiguity. ARM7: removed unnecessary destination register for one MOV variant. Improved precision if memory accesses are unsharp, by reading all possible values and combining them up to a certain threshold. The option “Do not analyze values of memory cells” is now honored by StackAnalyzer. Improved warning messages about possible targets of unresolved computed calls. Improved precision of the bitwise-and operator. Performance improvements for the analysis of unrolled loops with many contexts. 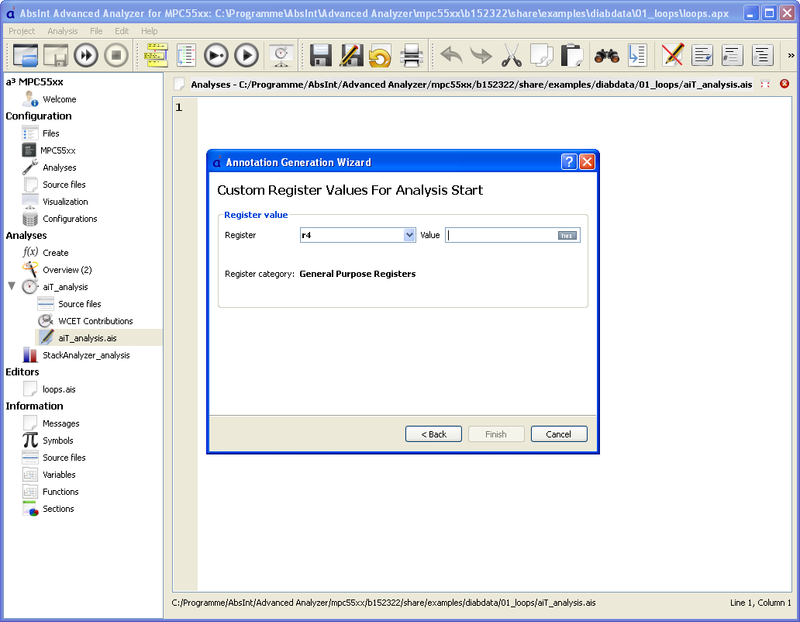 HCS12: value analysis no longer determines memory accesses for computed jumps. M68020: improvements to the btst instruction. interactive value analysis now also shows the contents of the processor status flags updated by comparison operations (the flags are usually Negative, Carry, Zero, and Overflow). improved annotation handling for mirrored memory areas. Warnings about unbounded loops or recursions are now only information messages, as they may be bound by flow constraints. Prediction file base path analysis: massive speedup of poptimize2p for the case of extensive splitting/joining in basic blocks. Unresolved computed calls and branches are now handled as potential program exits for pipeline analysis, in addition to triggering warnings. Better handling of conflicts between memory annotations provided through the GUI and by the user. M68020: improvements to the timing model of the M68020 processor (btst). now allowing higher waitstates for flash. V850: improved handling of invalid memory area annotations. MPC7448: improved selection of memory areas for accesses. MPC755: support for handling of nop tail instructions. a 1:1 clock ratio between the processor core and the L2 cache unit is now assumed. Default configuration values are no longer shown in the textual report files.